Jeremy Scahill is a war correspondent for The Nation magazine who brings out the story of the Joint Special Operations Command, a unit that is centered around international reactions to terrorism and is responsible for targeted assassinations–which surprisingly became more common under the anti-Bush peace-proclaiming President Obama. Directed by Richard Rowley, Dirty Wars is a well-edited and compelling documentary, engagingly revealing an ugly, but often discussed truth about the US government’s immoral military decisions. Originally investigating America’s avoidable tendency to kill innocent civilians in the Middle East (who satirically refer to US elected officials as the ‘American Taliban’), Scahill’s interviews with the families of innocent individuals shot dead by Americans are poignantly raw. Watching the young children nonchalantly discussing these incidents alongside their elders is even more devastating, but Scahill’s frank interviews really help to hammer home the documentary’s initial central statement (that innocent people are dying for no reason because of American manoeuvres). During these interviews with families of victims, as well as with witnesses to JSOC’s unjust schemes, Rowley’s camera work is beautifully intimate. Scahill’s film takes an even darker turn when it looks into the assassination of Anwar al-Awlaki, an American citizen who was denied the right to trial guaranteed all Americans. Scahill gives an in-depth look at the CIA-led drone strike against the New Mexico-born al-Awlaki, a Yemenese American imam, while in Yemen. The White House said al-Awlaki was an active al-Qaeda recruiter. Grounds for arrest – or assassination? The Justice Department asserted that the killing was constitutional because President Obama decreed it so. Two weeks later, another drone strike killed al-Awlaki’s 16-year-old son, Abdulrahman al-Awlaki, who was born in Denver. The administration said he was not the target, but refused to say who was. Lending an engaging and powerfully written voiceover to the film, Scahill (who audibly conjures up memories of a young Ed Norton in Fight Club) admirably puts himself in multiple dangerous positions throughout the filming of this documentary. Winner of the prestigious Sundance Film Festival, what this Oscar-nominated documentary reveals is infuriating and depressing in the same ways that much of today’s current events are: cover-ups by the powerful of their own misdeeds, and different notions of justice for the connected; and Orwellian manipulation of the facts, wherein everything is a lie told by a madman to be denied until it’s suddenly a triumphant truth that everyone knew all along. But this is notable, too, as an instructive reminder of what real journalism looks like, and what it takes to ferret out the facts. His evident passion to uncover the truth is evident in each and every frame of the film, thus, making Dirty Wars a thoroughly interesting film that presents a highly thought-provoking debate. A press pass and a military minder don’t get you close to reality; stepping off a beaten path, literally and figuratively, and showing up “where journalists never show up to ask questions” does. 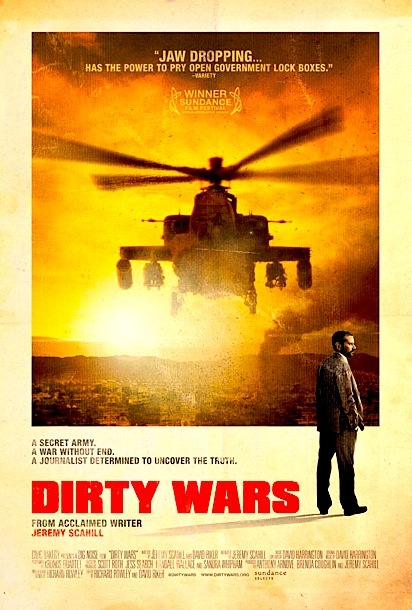 Dirty Wars is an intensely gripping and harrowing documentary that’s incredibly detailed in its approach to its debate about unethical US actions.